The benefits of natural pain management extend far beyond just relieving your pain. They also give you emotional relief and satisfaction. If you’re dealing with consistent pain over time, you will likely have less tolerance for the side effects that come from traditional pain medicines. Turning to pain-relieving herbs like the ones listed below means you don’t have to just “deal” with the pain—you can lessen it or get rid of it completely, and without side effects. Another benefit is that herbs make it easy to spruce up meals instead of having bland meals. You can add herbs into all your food. They’re a simple, beneficial way to bring some creativity back into your life if you or a loved one is facing cancer. Natural painkilling herbs can greatly reduce your need for medication. They have the advantage that you can take them all the time, they aren’t addictive, and have a whole range of benefits that drugs don’t have. It should be safe to use over time. The following herbs meet all three criteria. 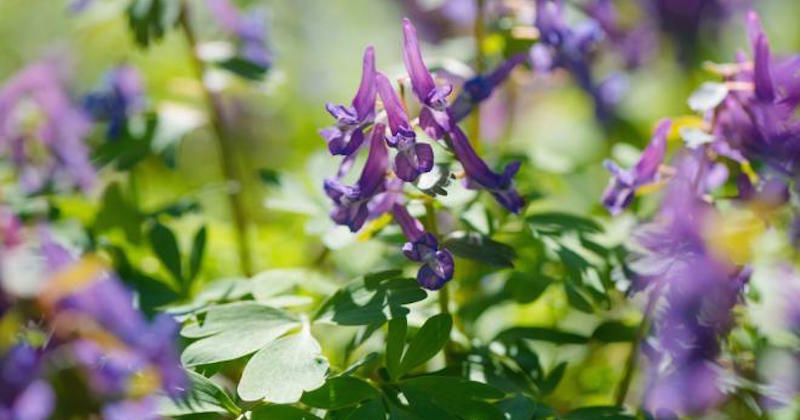 Corydalis Yan Hu Suo—the root of the Chinese poppy plant, known for its beautiful purple flower—is a staple of Traditional Chinese Medicine. It grows in abundance in China, Japan, and Siberia. Corydalis contains the compound dehydrocorybulbine (DHCB), which is what gives the plant its sought-after painkilling properties. DHCB is an agent isolated from the root of the plant that has a positive effect on the three primary types of human pain—acute, inflammatory, and chronic/neuropathic pain. Corydalis is so potent that Western medicine practitioners are beginning to use it to ease the pain caused by terminal cancer. Even though it works like an opioid, it takes a slightly different path. It does not affect your morphine receptors, which raise your risk of addiction. Instead, it binds to dopamine receptors in your brain. Dopamine is your brain’s “reward system” that controls feelings of pleasure and emotional response. Unlike opioids, your body doesn’t build a tolerance to this natural compound. This means you won’t have to keep taking more and more of it to get the same amount of relief. The oil of frankincense has been used for thousands of years to quell disease-causing inflammation, support heightened immunity, and prevent dangerous infections. Many people remain unaware of the added cancer-fighting potential of this precious serum. Also known as boswellia, frankincense claims as part of its vast nutrient profile a unique compound known as acetyl-11-keto-beta-boswellic acid, or AKBA for short. Scientific tests have determined that AKBA is a sworn enemy of cancer. A research from the University of Leicester were able to uncover how frankincense may be a safe and effective remedy for women who suffer from ovarian cancer—one of the leading causes of cancer in women. The healing benefits of frankincense have traditionally centered on disease prevention and anti-inflammatory properties, and researchers have been able to confirm that boswellic acids contain a potent ability to modify the immune system as well. Part of having a more efficient immune system is the regulation of inflammation, as well, which can have effects topically or systemically. The beauty of immunomodulators is that they can stimulate an under-productive immune system that allows illness to creep in, while also relaxing an over-productive immune system that attacks itself or benign substances with inflammation, often becoming painful, chronic, and debilitating. By regulating inflammation, frankincense oil is a powerful tool not only for acute illness but for chronic and autoimmune disorders such as Crohn’s disease, rheumatoid arthritis, ulcerative colitis, and bronchial asthma. Weight and other metabolic issues are linked to inflammation as well, so even when these chronic conditions are not an issue, inflammatory illness is still a concern to monitor and prevent. CAN YOU TELL WHICH EGG CAME FROM A HEALTHY CHICKEN?